The future Internet will be a flat pervasive network in which users will generate and share content dynamically on an unprecedented scale by exploiting the rich capabilities of their mobile devices. At the same time, the social behaviour of the users will be a key driver of their content generation and consumption patterns. Mobile devices will form spontaneous networks that extend traditional (mobile) networks, enabling users to generate and share content anytime and anywhere. This scenario is targeted by the EU SOCIALNETS project (Social Networking for Pervasive Adaptation), which commenced in February 2008 under the FP7 FET Pervasive Adaptation initiative. It takes a human-centric approach to communication by establishing a social network of relations between fixed and mobile devices. This is defined by human users and their particular actions and behaviour with respect to each other and the technology in the environment. The goal of the project is to establish new paradigms for pervasive networking in the future Internet, where models of the users social networks are a building block for the design of self-organized communication and content-management services. 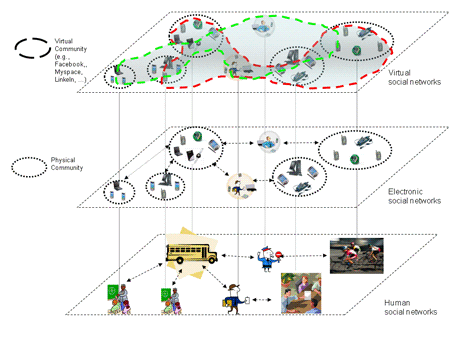 Figure 1: The SOCIALNETS vision. To date, emerging methodologies for self-organized networking draw inspiration from biology and the autonomic nervous system. While these approaches can be highly effective, they are not naturally aligned with human behaviour and thus fail to capture the details of whom we interact with, why, and how. In response to this limitation, we are developing a new people-centred approach by exploiting the core characteristics of human behaviour. Social networks are intimately connected with the human and are the basis for the SOCIALNETS paradigm. The project seeks to understand, model and exploit these structures using an interdisciplinary approach involving social anthropology, complex systems, network engineering and computer science. Within the project we exploit social anthropology research which describes the inner structure and evolution of an individuals social relationships. This evolves from fundamental results describing the structure of social acquaintances between people. In particular, M. Dunbars number dictates that the typical person can only maintain about 150 acquaintances. Additionally, members of an individuals social circle do not all have relationships of equal closeness. Rather, the group is structured into a series of circles of decreasing acquaintanceship, the size of which scales with a remarkably consistent ratio of almost exactly three. Thus there appear to be important constraints on both the structure of natural social networks and on the quality of relationships. Physics approaches that embrace complex network analysis allow us to derive compact models of these social properties, which can then be used as context information for pervasive networking systems. For example, recent results achieved in the project allow us to relate the frequency of interactions between users to the level of acquaintance between them, according to simple yet expressive mathematical relations. In SOCIALNETS, the networking research departs from the convention that fully connected, end-to-end paths should be maintained to enable communication. This is unrealistic for many small and low-powered wireless devices. Reality requires radical rethinking, with network architectures opportunistically harnessing contact between users devices to exchange multimedia and messages. As stable topological views of the network cannot be maintained in dynamic pervasive networks, SOCIALNETS complements traditional network topology information with context information derived from the social acquaintances analysis. This will allow us to build an Electronic Social Network encompassing users mobile devices. Conventional communication decisions (eg which node to use as a message forwarder) are taken opportunistically, by dynamically evaluating the fitness of encountered nodes to fulfil the required task (eg how likely an encountered node is to meet the messages eventual destination). Social relationships between people thus translate into social relationships between their devices, with associated measures of trust that are of primary importance in communication. This allows us to derive a social electronic topological view of the pervasive network, which we see as the equivalent, in the future Internet, of conventional network topologies. On top of this, SOCIALNETS explores novel ways of managing and supporting user-generated content. Rather than a means to establish communication between devices, the network is seen as a shared space for users to store, discover and retrieve content of interest. To enable this vision, we are building on the social electronic topological view described above, to blend it with information about the structure of the users social communities and their interests. This forms a knowledge base on which content can be replicated, placed and searched for, according to the expected users social behaviour and patterns of interactions. adaptive trust and security that are community-based and that exploit groups of users with commonality between them. The seven European partners participating in the SOCIALNETS project are: Cardiff University (Coordinator, UK), National Research Council  CNR (Italy), University of Cambridge (UK), National and Kapodistrian University of Athens (Greece), University of Oxford (UK), University of Aveiro (Portugal), and Institut Eurécom (France).